For supper Monday evening, Matthew and Louisa made gluten free pies. Matt made another lemon meringue. Louisa made her first pie: banana creme. Matt's didn't make it to the table without a little vandalism. Johnny had scraped off and eaten a significant portion of the meringue. Both pies were delicious. 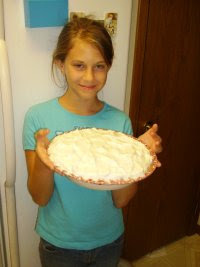 Good job, and congrats, Louisa on your first pie. The pies were good for filling in the cracks. Monday morning and afternoon I spent doing household repairs and chores. My home made anvil came in handy for straightening drawer rails and some hinges. In addition to the many other things he did, Dad helped out a great deal on a couple of the projects that required more than my hands or brain could do. Thanks very much, Dad. Mom was so helpful around the house with all kinds of things. Thanks, Mom. After supper we had devotion and I baptized Donna. I'm not sure when we'll have affirmation in Church. I need to ask Mary what she thinks. Probably we will wait until Donna's sponsors, Char and Dave, can come for a visit in late October. Monday night I wrote an article for the Grygla Eagle newspaper. I did it on Baptism and why we baptized Donna. There are quite a few Pentecostals in the area. I hope this gives them some good Scripture to think about. Here's the link to the articles. If you're a Confessional Lutheran Pastor and need something for a newsletter or newspaper, go ahead. If you think an article is worth copying, please be my guest. If you find something problematic, please let me know. Tuesday morning Mom and Dad said goodbye to us all and went home. 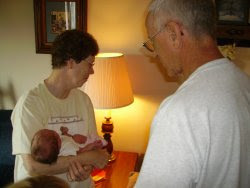 It was so nice to have them here to spend this time with their grandchildren and with their newest grandchild. I'm hoping to go down to their place on Sunday to harvest that ash tree. Dave, I'll try to save a piece the right size for a guitar back and sound board. Email me about the kind of piece and size that you would like and I'll try to accommodate you. But remember, I'm a wannabe amateur at all this stuff. For a week or so the kids have been telling us that there's a bird with a nest in one of the low pine trees. We tell them, "Leave it alone." They said, "But it looks like it's made of plastic." I invaded the bird's privacy just enough to get this photo. 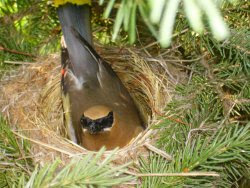 A beautiful Cedar Waxwing. Yes, it kind-of does look like it's made of plastic. Brad N's mom fell today. I took Jeremy in to TR so I could do a Hospital visit. We just missed them. She was sent home with a cast on her arm. So Jeremy and I did our shopping and on the way home stopped by Brad's place to see how things were. Well, they weren't home yet. Oh, well. I started cleaning the garage today. Hopefully I can finish tomorrow. But on the way home from TR I broke the rear suspension on my car. I didn't treat it badly. The joints were old, and the rustic road I took had grass that was tall enough to put too much drag on it. Mary and I will go to Fosston tomorrow to take it in to the guys at Rosebud Cenex to get it fixed. Dad, I'll have them check out the squeak in the steering too. This machine means that there's construction. It's called the Piranha. So they're threatening to tear up the road for resurfacing this week. There are two stretches that I use each week that will be under construction: From Grygla to the Gully road. And the RL Co 6 between the Oak Park road and the Trail/Fosston road. After church I got the kids back and put them to work finishing up cleaning so that I could get Mom and Donna. I went to get Mary and Donna. 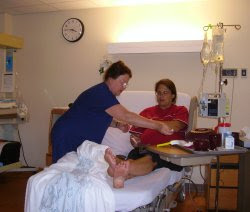 While at the Hospital I took Mary and Donna over to see Esther R. Esther fell and broke her pelvis this last week. She has a lot of pain moving from bed to chair. At her age there isn't much they can do for her. Keep her in your prayers, please. She sure liked to hold Donna. After a couple of other stops in the hospital/nursing home we went to the grocery store to pick up a few things and then home. Everybody wanted to hold the new baby! My folks arrived safely this evening with Jeremy. I put other photos at Esnips.com. Ok, I uploaded to esnips. I hope this works for some pictures. Let me know what you think. I'll get some other photos up at esnips as well. 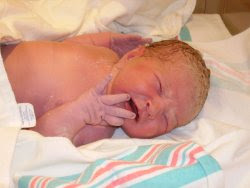 Donna LouElla was born at 4:12 this afternoon. More pictures available at flickr here. Not all my pictures uploaded. The net connection dropped before some of the photos with Mary in them could be uploaded. We went in after noon. Mary started pushing around 3pm. Donna breathed her first air at 4:12. 8lbs 2 oz., 20 and 3/4th inches. Mary and Donna are doing well. Please keep them in your prayers. And thank you, Lord, for these Your precious gifts. Mary was up at 3:30 am with contractions. John was up because he's 3 years old. Mary kept putting him back to bed. So, I got up early, because John decided to sleep in our bed. Mary was out on the couch in the living room trying to time contractions while getting some sleep. She though that her time of travail might be upon her. So, in the morning, what does she decide to do? 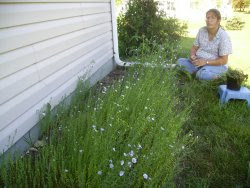 Weed all the garden and her flower beds. This is a kind of Active Inactivity which she hoped would hasten labor. Well, she got what she wanted. John and I walked around snapping photos of various things and doing odd jobs for Mary. 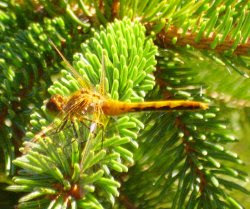 So we took photos of dragon flies, birds, flowers, and anything that tickled our fancy. Mary kept up her Active Inactivity. If that sounds Zen to some of you, well, kind-of, it is. But that's just my whimsical way of describing what she was doing. John loves flowers. He's too young to be self-concerned with his appearance. 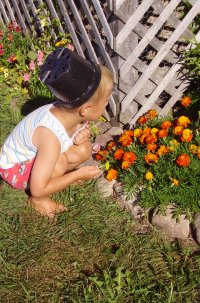 So when Mary asked him to take some weeds she had pulled out to dump, he put the flower pot that held the weeds on his head when it was empty. Then he went back to enjoying the flowers. He's kind of like "Ferdinand" by Munro Leaf and Robert Lawson. Cheryl B is recovering in GF hospital. She's in a lot of pain, but her recovery from surgery is going well. Please keep her in your prayers. And, yes, we went to the hospital today. We left at 1pm. But that's for the next post. Stella, Elsie, Me, and John this evening. I spent time working on SS WS planning, sermon writing, and updating Parish web pages. 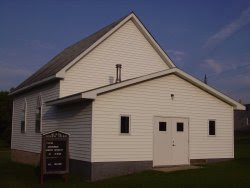 The new page at the parish website is here. Basically it's a reference page with news resources for me and on me at the parish site. Mary had the kids doing a little garden work today. Jeremy's at LYA Convention. There were supposed to be photos of the convention at http://web.mac.com/tonypittenger/iWeb/LYA07/Photos.html but it looks like they're having some problem with that. Matt, Louisa, Elsie, and Clara went over to Connie's today to help Alison do some canning. This evening I got a call that Cheryl B is in the hospital at GF. If we don't have a baby tonight, I'll try to get there in the morning. Please keep her in your prayers. On Wednesday, after making all the proper arrangements for Mary, in case she goes into labor, I took Jeremy down to Alexandria, MN where my father met me. Dad would take him home tonight. If possible, they would tour Echo Charter School in the morning. We met at Wendy's on the south side. As per Mary's and my arrangement, I asked the manager at Wendy's, "Did Mary Abrahamson call to say she was going into labor." The somewhat shocked young man said, "I, ah, no. No I didn't get such a call." We had a gluten free chili and chocolate frostee. And I drove back home. On the way I stopped at the Fosston Hospital. "Did Mary Abrahamson check in? She would be having a baby if she did." The nurse smiled and said, "No, she hasn't," with a look of curiosity on her face. "I had to go to Alex this morning, I thought I'd stop by to check on the way home, just in case." She smiled. I went home. When I got home and saw Mary, I noticed that the baby had dropped a bit. Given her symptoms we thought it might be that evening. It weren't so. It's almost noon on Thursday, still no baby. Pr. Stafford called to let me know he could fill in for me on Saturday at Mt. Olive. Thank you so much. So, Yesterday, or the day before, I don't remember which, I played a Dub song and the kids all started dancing. Dub was really popular back when I was in college. I guess there's a reason why. Anyway, it's Thursday noon. I did some sermon work this morning. We had rain, and it's cooler today. No baby yet. This afternoon was Ernest's funeral at St. Petri. It was hot. I told Wayne W that I was going to go get three cases of bottled water, but he stopped me and went and got it himself. And he brought it in coolers with ice. Thank you, Wayne. These he handed out to those who wanted at the beginning of the funeral. Quite a few of the guests at the funeral commented on what a nice thing that was and how they had never seen that before. Well, St. Petri has no air conditioning, the day was very hot, and we didn't want people to have health problems because of a funeral. To some this might be a liturgical innovation. To us it seemed like simple consideration for our guests. I got home about 4pm. Mary had a check-up with the Dr. today. She was due yesterday. So I asked the question, "Any contractions yet?" Yesterday we planted a few bushes in the middle of the heat of the afternoon. But we couldn't get the baby to come with this exertion. I got up really early this morning. Read a while, made breakfast. I knew Mary was awake so I made some for her too. But by the time it was ready she wasn't out of bed. So I brought it in to her. She looked at me like "Who are you, really?" But out loud she said, "Thank you, sweetie." Now, breakfast in bed might seem a nice wonderful thing to do for someone. But I have to admit, I was being selfish. You see, I had a funeral today, and I didn't want the complexities juggling a funeral and childbirth. So I tried to make my wife comfortable. If she's comfortable, I reasoned, then she might not go into labor. That's not to say I wouldn't make breakfast and serve it to my wife while she was still in bed simply out of love. It's just the recognition that in 18 years of marriage we can count the number of times I've actually done this on 3 fingers. Well, no baby yet. The kids watched Indiana Jones III tonight. It was too predictable for me so I came over to the office to finish up some work and write this. We still have colds. My sinuses are painful now. That probably means I should go to bed. So, goodnight. It's late Monday and Mary hasn't had the baby. Today was the due date. Mary usually (7/8 times) has been a couple of days after her due date. Today is my Dad's birthday. Happy birthday, Dad! Sorry we weren't able to give you a nice new grandchild on your birthday. Yesterday, Sunday I held worship at St. Petri, Nazareth, and Oak Park. There was a special lunch after Oak Park for Glen and Linda. This week was Annette V.'s birthday and her and her husband's wedding anniversary. Thanks to God for His grace in providing for them through the years. 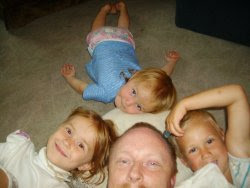 Both Glen and Linda H. , as well as Annette and Glen V., have wonderful children and grandchildren. And it is a great privilege to serve them as their pastor. I couldn't participate in the lunch. Funeral planning for Ernest R. started at 1pm in TR. I zipped off to Thief River Falls to be there. Ernest's funeral is at 2pm Tuesday at St. Petri, with visitation at 1pm before the service. It was hot today, and it's forecast to be hotter tomorrow. Please keep Ernest's sister, Cora, and their nieces and nephews in your prayers. This is a drawing of the Gezer Calendar. The drawing is from Joseph Naveh's book "The History of the Alphabet." This particular bit of writing is on a small (about 5 1/2 inches by 2.5 inch by 5/8 inch thick) piece of limestone. The rock was found in 1908 by an archaeologist named R.A.S. Macalister in the ruins of the ancient Biblical city of Gezer. Gezer was one of the few ancient cities that actually had its name written on rocks at its city limits. That's how we can be reasonably certain that the rock comes from this Biblical city. But several scholars who study writing make comparatively educated guess that this rock was written on between the 12th and 5th centuries before Christ. The more recent datings put it at about the 10th century based on the style of the alphabet. Some of you might recognize the shapes of some of our letters in this inscription. P and W and Z kind of stand out, even though the P is backwards and is actually equivalent to our "R". The W is actually pronounced "sh." And the funny Z with the extra vertical stroke on the left is pronounced something like "ts." The O doesn't have an equivalent in English but is something akin to choking on steak and trying to say the the letter G. The Y is what became our sound for W. The circle split down the middle to look like a backward P attached to a P is the letter Q. The little triangle is the letter D. The letter that looks like a sideways M with an extra leg is an M. The letter that looks like H with a bar at the top and bottom is pronounced "ch" like when you showed your mom something gross and she said "Ach! Put that away!" You get the idea. And there are no vowels written down: just consonants. Tht mght b hrd fr sm t rd. Bt f y gt th hng f t. Rdng wtht vwls sn't s hrd. I'll give you a transliteration of what it might have sounded like and then a translation. And the vertical writing might by a name: "Abi" or "my Dad." 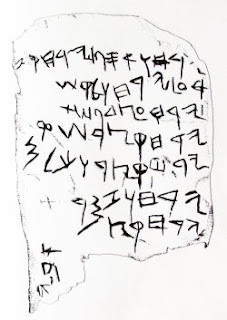 There are a lot of things that this inscription teaches scholars about the alphabet and the shape of the Hebrew language. But what strikes home to me is this: Farmers have always needed to educate their children about the right time to do things. Whether it was 1000 years before Christ or 2007 years after His birth farming is still the starting place for feeding everyone in this world. And farming is one of the first places that needs education and a written record for that education. Some people today may not even know that milk comes from a cow's teats. And if they were told this they might be so grossed out they would stop drinking milk. But they'd probably still eat pizza and want all that wonderful cheese (from the same cow teats) and bread dough with tomatoes and oregano covered with pepperoni (dead cow) and sausage (dead pig). And they'd probably want to have a few beer's with it (wheat and barley). So if you farm, rejoice in the long heritage of this vocation. It is truly the first vocation. For God placed Adam in the Garden "to till the ground." (Genesis 2:15) The world truly does depend on God's providential grace through you. The Gezer Calendar shows us that kids were learning this skill from their dads in ancient times and that the farmers had to write things down, even then. Anyway, no baby yet. So after I was done with my sermon for the funeral I reviewed an old inscription. I thought you might enjoy it. I like old Semitic inscriptions quite a bit. So, now I'm going to bed. And if Mary wakes up a bit I'll ask her, "Any contractions?" And she'll groan at me, roll over and go back to sleep. This is Mt. Olive in Trail, Minnesota. It's cozy. If we pack the building we can fit maybe 80 people. The population of Trail is 63 according to the sign on the road. We have between 11 and 25 people at service on any given Saturday. That's between 17% and 40% of the population of the city. Over the past few years communicant membership at Mt. Olive has grown. And because the congregation is small, the statistics look great to anybody who would evaluate on the basis of percentage of growth. I have 3 to 4 kids in Saturday School each Saturday. I also have two confirmands attending class each Saturday. I want to point out that the Confirmands come because they want to, not out of parental pressure. After worship, saturday school and confirmation class I went home. I called the funeral home to find out about planning for Ernest R's funeral. Planning will be tomorrow afternoon in TR. Our family has a cold virus. Summer colds really take the wind out of my sail. This one has incredible sinus pain combined with a raw throat that feels like it's on fire. I've been megadosing vitamin C, B, and Ecinacia. When I got home the sinus pressure and pain were bad. Mary made an ice bag for my head and I napped until 2pm. I felt quite a bit better after the nap: enhanced of course by Ibuprofin and Pseudepinepherin. Then it was time to eat and get ready for the wedding. Angela and Knute are in the middle. The wedding was at 6pm this evening. It was a bit hot in the church. With my Alb on I still had rivers of sweat running down my back. I preached on the Jesus' first Miracle at a Wedding, and that Christ chose a wedding as the place for the first time He displayed His authority as the Second Person of the Trinity. The point brought home is that Christ cares about marriage. He cares enough to help out a new groom in an embarrassing situation. He cares enough to give His life as a ransom for the bride and groom present here at this wedding. And He cares enough to build their relationship through the forgiveness of sins and leading them through the troubles of life by His grace. The reception at the Trail Pavilion was very nice. A good meal, and the breeze and temperature made the evening totally enjoyable. I got to hold Mike and Amanda's baby, Emma, for a while. I stayed at the reception until 8pm. I came home to ask Mary one question: "Are you having any contractions?" "Just the usual." She says. This leaves me a bit puzzled, but I don't pursue it. She said it in a way that indicates that I ask that question way too often, and that she's not ready to go the hospital yet. Leave well enough alone, Joe. Stella and John played with a box this evening. They liked to pretend it was a mask. Here's Stella peeking out from the box. I had to read some of my sermon this morning. I'm going to go through it a few more times tonight so that I don't have to look at the paper in the morning. Glenn and Linda's anniversary is actually the same as ours, September 30th. But they started in 1967. That's the year of the first Superbowl where the Green Bay Packers beat the Kansas City Chiefs. Stella liked the juice: especially the red juice. Notice on her forehead just at the hair line of her bangs, there is a line of red juice from the upper lip of the glass she was using. In 1967 "Wild Thing" was the big hit. "Wild thing, I think I... Love you...."
Here we have some of the many people gathered at Arlan's place to celebrate his folk's anniversary. Robbie and Stacy and their kids were home from Boise-enjoying the cooler temperatures here. Kyle and Teira came with their new baby. It's nice to have new babies around-especially in mixed company like this. I can offer to help out one of the parents by taking care of their baby while they do something else. I got to carry Robbie and Stacy's baby around for a nice while. Stella and John wanted to kiss her. I guess I'm really looking forward to our baby being born. By the way, take a look at Kyle's record. Just a few years ago I wanted to enter the Diamond Nationals to see how I could do. I didn't. Such an expense and risk was outside of the responsibilities I had on me as a professor at Bethany Lutheran College. But Kyle is such a mild mannered guy. You wouldn't suspect that he's such a successful prize fighter (except for the occasional bruise). But I digress. I didn't know if my granddaughter has learned her colors yet, so I decided to test her. I would point out something and ask her what color it was. She would tell me and always she was correct. But it was fun for me, so I continued. 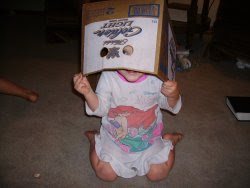 At last she headed for the door, saying sagely, "Grandma, I think you should try to figure out some of these yourself." It was a great party. 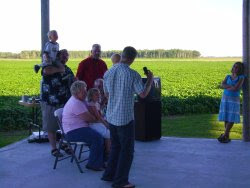 The concrete floor you see in the photos was made by the Amish group in our area. 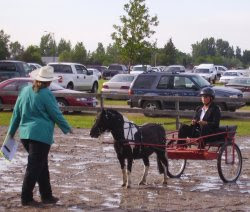 I'm not sure why Arlan wanted the Amish to do it, but that's one of his eccentricities. I saw some water tubes coming out of the floor. I guess that these are for heating. At least the Amish don't object to putting in slab heating. There are two other things to note about this evening. First: I forgot Clara! Poor Clara. She fits the Jan Brady profile. She was out in Arlan's chicken barn when I got the kids together to go home. Alyssa, the parish secretary, had said she would take Sophie to her place. I was going over to Alyssa's to check on a computer problem. And, in case any parishoner is concerned, this is the second house call I've made for resolving computer problems. The first was at Connie's when she was parish secretary. Both had to do with their ability to do their work as secretaries in the parish. Back to Clara. I thought I had called all the kids to the van to go. Ione and Edwin offered to take Louisa and Elsie home later so they could take part in the dance. We let them. But I forgot Clara. I'm sorry, Clara. I didn't know you were in the chicken barn terrorizing all the chickens, guinea fowl, and other assorted birds that Arlan keeps. Mary and I realize this right after we got home. But Ione and Edwin came soon afterward and Clara was with them. Whew! I'd imagined all sorts of terrible things to condemn myself. I really thought I had talked to her and made sure she was in our van. But everything worked out ok for her. The second thing is less good. Ernist R. died today. He is a member at St. Petri, and a shut-in. I was supposed to have visited him on Tuesday. Well, I was in the hospital in Fosston with my wife. His sister, Cora, has dementia. She has been home with Ernest for the last month and a half. I'm not sure how she is taking this. She now needs to be confined for her own safety. And she may not understand what has happened. Please keep her in your prayers. Friday morning, a herpetological first for our kids! A Garter Snake fell into one of our basement window wells. Of course everyone wanted to see it. Several kids wanted to catch it. Mary was way cool on their catching the snake. But I wanted to be "Jim Fowler" to my family's "Marlin Perkins" in our own adventure of Wild Kingdom. So I found a short piece of PVC pipe. Matthew ran to grab some shoe strings. And I assembled the infamous Snake Noose by putting the string through the pipe with a loop at the action end and pulling tight on the strings at the handle (only later to find out that my original design had already been patented, think of all the money I could have made if I'd been there first!). So I made my PVC Snake Noose. "Jim will now attempt to use the snake noose to catch the wild, fast, and wily immature Garter Snake." And I caught the snake! Now, of course this particular snake was so young that any teeth it has wouldn't have broken my skin. It's just the DIY nostalgia from all those Saturday evenings as a kid getting out of the bath, warming in front of the wood stove, and watching Marlin and Jim wrestle with all kinds of wild critters. All I cared was "I made a snake noose, AND IT WORKED!!!!" Though everyone was willing to trample Mary's flowers to see the snake in the window well, only a few wanted to touch or handle the snake. Of course, for regular readers it will come as no suprise that Clara wanted to pet and hold the serpent first. 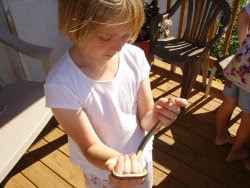 After all, she's held pythons and boa constrictors at the Bemidji Science Museum. Sophie pet the snake. John was a little creeped out by it. Stella wanted to kiss it an hold it, but she has this oral fixation at her age that kind-of made me cringe thinking what she might do. So we just let her pet it. 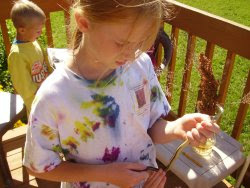 Elsie did a good job handling the snake. "Are you going to kill it, Dad?" "No. It eats all kinds of pests. This is a helpful little critter." We let it go in the strawberry patch. It probably has left by now. But I hope it sticks around and eats lots of grasshoppers. Psalm 118:25-26 is used at Jewish weddings. I was unable to find a version of it that didn't include the rest of the wedding song lyrics. A version from Lewis Lewandowski (1821-1894) is available here. Take a look through it. Otherwise, I could make up a melody for it. Would you like הודו ליהוה כי טוב כי לעולם חסדו? I could recite and sing that one on jodidly. With regard to the moire wire cross craft I mentioned to you here's a cheap-o foam craft version to use as a model. Just count the number of nails you need for each part of the cross. Get some finishing nails and some nice thread or fish line. Put dots on some wood blocks for the kids to drive the nails in, or have someone set the nails for them ahead of time. Then wind the thread or fish line like in this example. It's not really hard, it just takes a bit of forethought. The false labor left me with a ragged recovery on Wed. Today I had a planned to write, because, well, a Pastor's main duty for his congregations is the worship service. I have 5 to prepare for. Actually, only two sermons this week: one for regular weekend worship, the other for the Knute and Angie's wedding on Saturday. Mavis had a treatment yesterday for her back. She'll have another in two weeks. I think it was a steroid shot. Keep her in your prayers. Her back is causing her a great deal of pain. So today I worked on the second sermon. I was able to write the other one last night. But the time limitation for this second sermon is more severe. Ironically, to those who don't write sermons, shorter sermons seem to take much more time. I'm reminded of a quotation attributed to Mark Twain, "I would have written you a shorter letter, but I didn't have the time." I had spent the night in the fort with Elsie and Clara. We woke up pretty early. It was light at 4:30am and 49 degrees Farenheit. We all hid our heads in our sleeping blankets until Matthew called out "Breakfast" at 7am. After breakfast and morning devotion I went to the office to work on the sermon. Until this sermon is done I only take emergency calls. In the afternoon I spent an hour with the kids playing. Today I chose to get the kung-fu/karate weapons out for our play. Ever since I saw "Shanghai Noon" I've been fascinated with the Chinese weapon called the Meteor Hammer or the Iron Dart/Rope Dart. Look it up on YouTube and you can find some beautiful examples. There's a nice National Geographic video of this there. I started trying to learn this weapon last week. But I encountered a rather serious set-back. Jackie Chan had used a rope with a horse shoe as his weapon. I put a nice heavy half-pound nut and bolt combination at the end of my string of clothes line. Jackie's character in this movie was named "Chon Wang" a sound alike for "John Wayne." The joke in the movie is that "Chon Wang" could never be a good cowboy name, just as Owen Wilson's character name "Wyatt Erp" could never be a good cowboy name. Well, it was the Meteor Hammer that stuck with me. Spinning was fine. Quick horizontal shots went fine. Using the feet to redirect the trajectory of the chunk of iron went fine--two times. The third time, WHACK--right on the bottom of the inside of my right ankle. Oh, the pain, the stupidity. I felt it in my groin and kidneys. I gimped up to the house and showed Mary my new purple swelling with a brilliant red mark. "Stupid is as stupid does," was her sentiment. I've been putting camphorated ointment on the ankle since. That was a week ago. Today I replaced the nut-bolt combination with a tennis ball. Duh! I should have (In the words of Emperor Palpatine) "foreseen this." My ankle still hurts (and I still limp), but the tennis ball is very forgiving, where iron is not. So I got my trusty ViviCam 5386 out and made some video of my experiments with this new weapon today. The kids all got into the act as well. I brought out my sticks, single ended staff, nunchaku, three-sectional staff; and my Chinese TaiChi sword. We stuck with the sticks and string. We didn't get to the three-sectional staff or the sword today. So, I recorded this all with my camera set to video. I cut out a great deal and put together a display of my mediocrity with the meteor hammer; along with the kids working on staff, meteor hammer, and nunchaku. The video is inspirational to me. On the one hand, it shows me how slow and sloppy I have become with staff and 'chucks: showing me also how lame I am at the meteor hammer. I keep thinking, "Joe, you're fat, you're slow, you used to be a chiseled muscular piece of work. Now you're an overweight middle-aged pretender. It's hard to believe you actually trophied in national competition. All you've really done is atrophied." --That would be the negative reenforcement. On the other hand, it shows me how much fun the kids have with these martial arts. Even Stella wanted to get in on the action with the staff. This is the positive reenforcement. For those who may not have acquired the cultural literacy (i.e., wasted their youth listening to VanHalen) the song in the video is "House of Pain" from VanHalen's 1984. I thought it was appropriate given the topic of the video and my stupid ankle bruise. After our P.E. class I worked more on the sermon until supper. After supper we had family time, devotion, and watched another episode of Dr. Who (The Long Game). It is somehow gratifying to find my children enjoying the same kind of fiction I enjoy. There was an article in, I think, "The Motley Magpie" which pointed out some differences between Conservative Lutheran Pastors, on the one hand, and Confessional Lutheran Pastors, on the other. One of the differences (and the article was sarcastic) was that a Conservative Lutheran Pastor listens to conservative radio talk shows. While a Confessional Lutheran Pastor listens to classic rock. I listen to both, and I listen to public radio. I like science fiction: esp. Frank Herbert, J.R.R. Tolkien, Dr. Who, Star Trek and Analog magazine. I'm not sure where this puts me in the mapping that the Motley Magpie proposed. I suspect that I'm outside their own wildly sarcastic measurements. But I can tell you this about myself. There are four books that I read through every year. I read through them because they keep me centered on my duties in my call as a pastor as well as my higher duties as a husband and father. They are: the Bible, the Lutheran Confessions, the Evangelical Lutheran Hymnary, and Walther's The Proper Distinction Between the Law and the Gospel. The first should be obvious to any Christian. The second should be obvious to any Confessional Lutheran. The third should be obvious to any Confessional Lutheran Pastor. The fourth is, unfortunately, not obvious to those who claim to be Confessional Lutheran Pastors. In stead of Law/Gospel preaching many Pastors within the name of Confessional Lutheranism preach anecdotal sermons. While an anecdote or illustration can be useful--if and only if it helps to reinforce the Biblical text--many have turned to story telling as the main body of their sermons. The problem is that anecdotes or illustrations by their nature can only point to human experience. Human experience, by its very nature, knows nothing of the Gospel. Why not spend those few minutes each week using illustrations from Scripture. God knows that our members spend little enough time in the Word already. Most do not know Ahaz from Ahab. Why not use the time to teach them the Bible rather than telling them what you watched on TV or what the members of your last parish used to do. Walther's "Law and Gospel" is a great book that will help you break the cycle of anecdotes and present a Biblical centered sermon of God's Law and Gospel, highlighting sin and grace from which your hearers to benefit. Of course I didn't get to my shut-ins on Tuesday. Nor did I on Wednesday. On Wednesday it was all I could do to keep awake and keep myself from being cranky. Mary was wiped out as well. I did some office work, but mostly I had to recover from the sleeplessness of the false labor episode of yesterday. I did a little garden work and yard work. We got the three oldest kids to mow most of the lawn. 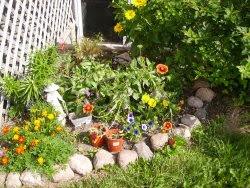 Mary's flower beds look nice. A bowyer (a maker of bows and arrows) from Oregon has offered to send me a bow stave that he manufactured with his own hands. That's a really nice gift, when you think of it. I appreciate it. My bow string looks nice right now. 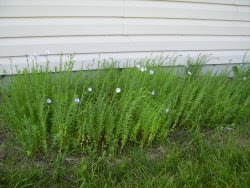 I didn't know how flax grew. The flowers are really pretty and delicate. Mary and I went out tonight on a date. We had a meal together at the Evergreen in TR. Just me and my beloved. 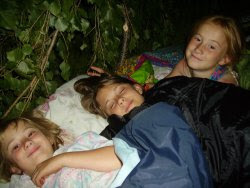 Tonight a couple of the girls and I are going to try again to sleep in the fort. I've got to write a couple of sermons yet. But I'll be out there soon. In the evening the kids were pleased to pose with the fort. Only Jeremy, Matt, and Stella were not going to be staying over night. To help celebrate a good clean-up of the branches and a successful fort building Mary made some home-made lemonade and sent that out with some snacks for the kids. My concern was that they not drop any food, nor that they keep any food in the fort: skunks and bear like food- as do many other critters of the night. The girls and John got settled in. I did some work over in the office but would check in with them every now and again. 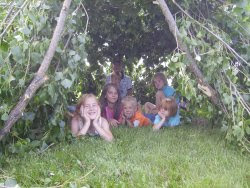 Finally, after reaching that balance of work accomplished vs. tired to the bone I also sacked out with the kids in the fort. About 2am Mary came out. "I think it's time." So, Louisa took charge of the ones out in the fort. Jeremy took charge of the ones in the house. Mary and I left for the hospital at Fosston. It was a very draining and uneventful stress filled time at the hospital. Chris and Alan took some of the kids the next morning. Alyssa and Quinten took some of the others. Thank you so much. We were anxious at the hospital. 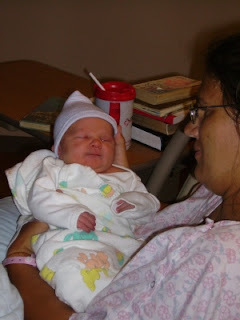 After 12 or more hours of augmenting labor with pitosin, they decided to release Mary. Here we are at 3:15pm Tuesday. Mary's signing the release form. You know, I used to pull all nighters quite frequently, especially in college. But at 40 years old with poor exercise habits, it really is a drag. I want to apologize to the kids for being so cranky after getting home. And my stupid crankiness continued the next day. Sorry kids. I took a lot of vitamin B. 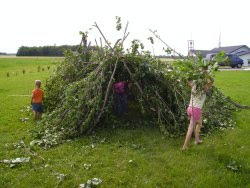 We'll try the fort again. The dishes are done. The clothes are done. The rooms are clean. The vacuuming is done. Everything has been dusted. The tree limbs are trimmed and cleaned up. Mary is in the garden. 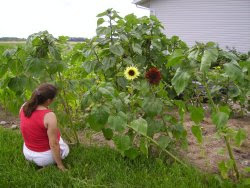 She is pulling weeds from the girls' sunflower house. Our baby will come in the next few days. Tonight I am sleeping out in the fort with the kids. Jeremy is sleeping up on the living room couch in case Mary goes into labor. Perhaps this is too personal for some readers. OK, well, I'm glad you enjoyed everything up to this point. Let me say it again, I love Mary. Maybe it will be tonight. Maybe it will be a week from now. When a boy has older sisters. There are many things to be grateful for about having older sisters--I suppose. Actually, I would not know: As I was the elder of two boys. But I am learning, and quickly. 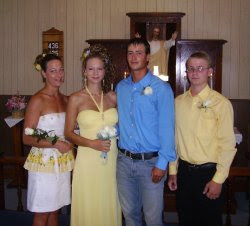 Johnny has a lot of older sisters. And they all like to play "Dress up". How are sisters going to dress their baby brother? I suppose this has been going on since time immemorial. But who cares about the past? What matters is: how does it affect MY kids? John's OK. As you can see from the position of his arms in this photo, he realized that the way his sisters had dressed him had compromised his masculinity. Tights, a skirt, a slip, girl's dress shoes: they were all too much. And, rats, dad's got the camera! At least Dad's letting me sleep in the fort tonight. 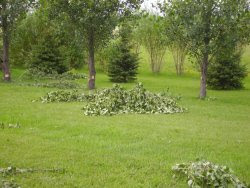 This morning I trimmed trees. They needed trimming on the bottom because we couldn't mow the grass around them. Mary, Pregnant Mary, had trimmed 5 or 6 of them a few weeks ago. But we needed something quicker. Dad sent up his electric chain-saw with Grandpa and Grandma when they came for a visit. So I got it out. It has a 14 inch cord. So I got out my super-duper long extension cord. It was 25 feet too short to reach from the house. So I hauled the 90 pound generator out into the yard. This is a Garage Logic moment. I'm probably not the first. But I think that I might be part of an elite group who have hauled an overly heavy gasoline generator around the yard to power an electric chain saw to trim trees. After a few trees I went and got my hatchet. I have blisters from the hatchet now. But my back isn't as bad as it would have been had I continued with the generator/electric chainsaw combination. I am going to be sore (I already am). Now I'm too pooped out to haul the branches to the other side of the yard. I need a good con to get my kids to do it. The back yard got clean quicker than I could recover. 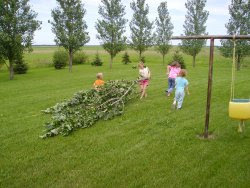 All the kids hauled all the branches, even the heavy ones out to by the campfire ring. "Dad, we got the wood out there. Can we build the fort now?" "Dad, can we sleep in it over night?" You have to love the barter system. "Sure, let's just trim the main poles for the fort. Let's see, who wants to do that?" So everyone learned how to handle a hatchet. We spun a bit of cord from the inner bark of the trees we had cut. But that was going to take too long. Matthew tried tying with bark strips. That could work. But I wanted it stronger. So we got my jute twine and started framing the fort. Now it got exciting. 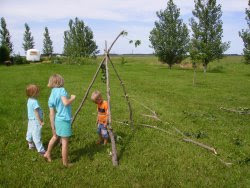 "Is it going to be a tipi, Dad?" "Nope! We're going for a bush fort. Something nobody'd notice if we were in the woods." Of course, we weren't in the woods. And I wasn't out of the woods yet. We used all of the brush and made a 16 foot by 12 foot fort. The girls had quickly designed 6 different rooms in the fort (One for Matthew, I guess). They even brought out a used coffee can and a roll of toilet paper. They eventually picked up all the scraps and made them part of the roof of the fort. Now, all of the girls and John want to sleep out there tonight. The weather is nice. Why not? The yard's picked up. All my brush is by the fire pit. I'm happy. Except the sore back and blisters. It was a beautiful morning today. We could have had worship outside, except the mosquitoes were bad. St. Petri, Nazareth, then Oak Park. My audio software is acting flaky (it's a Windows program). I'll try to get the sermon up soon. In the afternoon I had Knute and Angie over for their last Pre-Marital session. The wedding is Saturday at Mt. Olive. Just the family for the wedding. The reception is open to everyone at the Trail Pavilion starting after 6pm or so. Shirley, did you get that catalog with the brass crosses? 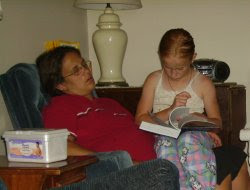 Saturday morning as I was getting stuff together I got a call that Clara P. was in the hospital in TR with an infection. My little Clara came with to visit Clara P. There was no church at Mt. Olive today so I spent some of the morning with Clara P.
I found out later that Betty had a brief visit to the hospital in Bagley today, also for an infection. By the way, last week I had my days mixed up. 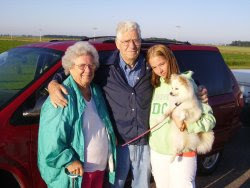 Grandma, Grandpa, and Amber went home Thursday morning, not Wed. as I had written. Saturday afternoon was weird. I loaded up the 5 oldest kids to take them to the 1pm showing of the latest HP movie. We got there in time, sat down, waited... "Sorry folks, the projector broke. We've got the repairman working on it right now, but if you want, we'll refund your tickets and snacks. The movie will be shown at the 4pm showing." OK. Things happen. So I loaded up the kids and we went to visit Esther R. at the nursing home. I'd planned to do this after the movie anyway. Esther wasn't there. Her daughter dropped by and took her out for a visit. Good for Esther! So we went home. I did some work on my sermon. And we went back for the 4pm showing. 2 hours and 18 minutes later we went home. It's dark. It's scary. And despite having made the kids go to the bathroom before the move and having no pop, most of them made a trip out during one or more of the scarier parts. The Dolores Umbridge character was excellent. Pr. 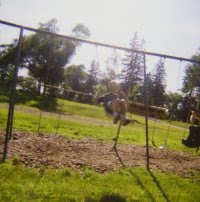 Gernander on a swing. Yes, he's a Texan. Yes, he enjoys a good swingset. Mock him if you will. But if you mock him for this, you probably do not have as much self-security as does he. BTW, Jerry, my email is ibnabraham at yahoo dot com. Just change the address to make it legit. Matthew and Louisa took a lot of photos during camp. Some of them came out ok. Louisa had just begun cutting some of them for her own collage of camp before I grabbed them and made digital copies. You can find the camp photos at my flickr site. Click here. 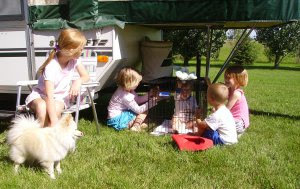 After flying kites on Friday; Matthew, Louisa, Elsie, Clara, Sophie, John, and I set off for the Pennington Co. Fair. On our way we stopped at Gloria's place. She had rotator cuff surgery and is in quite a bit of pain. She goes back to the Dr. this Wednesday and will begin therapy. She expects to be in church Sunday. Please keep her in your prayers. Several of our members participate in this fair. 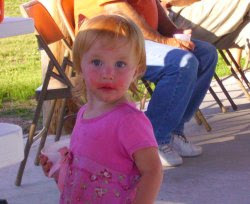 Here is Whitney N. Her lips and nose are blue--I think from cotton candy. At the horse exhibit several of her siblings, cousins, and friends were at work. They all did very nicely with their horses. 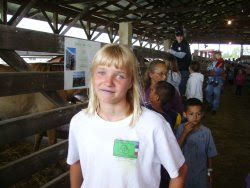 We saw Jonah and Alison and their children in the horse barn and cattle barn. Quinten and Alyssa were there with their kids also. There was a huge wall cloud over the fair which rained down very strongly for quite some time. During the lighter parts of the rain we ran from one exhibit building to another, getting wet and laughing. Johnny wouldn't quite get up the nerve to pet some of the baby goats. He wanted pop corn, pizza, and cotton candy. We made it through the vendor areas and the 4H and craft exhibits. The rain finally tapered off. But it was fun to walk through the puddles and streams of water. The kids were a bit ticked off that I wouldn't let them play any of the carne games. We got a pizza and corn dogs for the kids and watched a bit of a magic show. After eating we went over to see the horse exhibits again. They had resumed after the rain stopped, but the performance area was slick with mud. A couple of the kids were a bit pouty because I didn't let them go on the rides. But we had already spent several hours at the fair during the rain. And the rides couldn't continue until the lightning stopped. We crossed some rivulets of rainwater runoff by tossing the smaller kids. Clara's right at the weight where I can't toss her so well, but she's too small to jump a 4 foot wide stream. So I tossed her. She got all the way across, but she landed on her backside and got all wet anyway. Of course, she blamed me. I hope she can remember it as a fun adventure. There's no church at Mt. Olive tomorrow. It's Holy Rodeo Saturday. 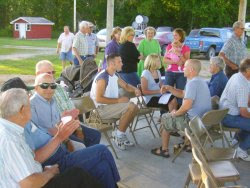 The second Saturday in July is the Gonvick Rodeo. The Mt. Olive Ladies' Aid hosts an annual bake sale at the rodeo. That's one scheduling difficulty with my Saturday scheduled congregation. Sometimes events work out on Saturday. So I bend with the wind like a willow. I hope to get to the rodeo in the morning. The kids hope to see Harry Potter in the afternoon. If I get to either, I'll let you know. Friday, before supper, before the fair, I had a promise to keep. 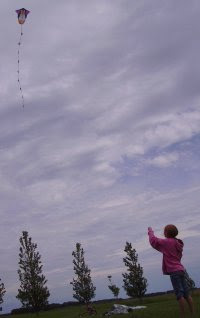 The girls wanted to fly kites. Louisa had acquired a kite from the library's reading program. But it was one of those cheap plastic kites. And they had broken it just trying to put it together. Over the past several years I've acquired a few good kites made of nylon, fiberglass and metal. The kind that won't break when a good strong wind comes up. We have plenty of wind. Let me say that again. We have plenty of wind. As one friend put it "There are no trees to block the view." So, in the first photo we have Elsie flying my penguin kite. I bought this kite because the penguin is the logo for Linux. Linux is the operating system that runs all my computers. The kids' school computer and Jeremy and Matthew's own personal computer (from which they are grounded) runs Windows. I could go into a huge diatribe about the benefits of one versus the other, but basically people should use what they are able to use productively. My experience is that you put Linux on a machine and use it. You put Windows on a machine and you baby it. Both have their problems. But I prefer the infrequency of trouble that Linux gives me. Louisa is flying a 5 foot kite in the second shot. This one was given to us by my Mom. Thanks, Mom. It's a great kite. The mylar tails are 20 feet long. 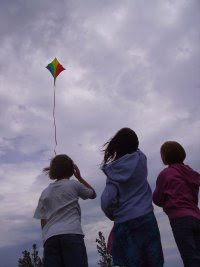 It takes a bit of time to wrap them up when your done flying kites. 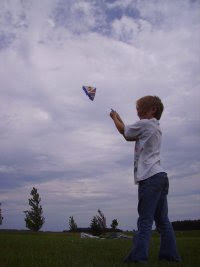 The third kite is a nylon V style kite with a cross brace. Clara was able to hold it down in the wind today. Sophie and John kept running under the kites and looking up. That's fine as long as the kites are in the air. But if one goes down we didn't want them near the string in case the kite took off again in a gust. Kite string is strong and thin. And it can make hamburger of an arm fairly quickly in a good gusty wind--which is what we had today. After kite flying we set off for a shut-in visit and the fair. 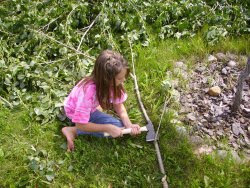 On Tuesday, after supper, I tried to split a dried ash sapling. I've never done this before either. I want to learn how to split logs and saplings to make a better bow. I think ash must be a particularly wiry wood. The split stayed true through the first three feet, then it started to taper off toward an edge so that I got a 5 foot chunk off the 7 foot sapling. Oh, well, live and learn. Wednesday morning Grandpa, Grandma, and Amber left for home. It was really nice to have them visit. We didn't do as much fishing as we'd hoped. But we had some really great conversation and together time. 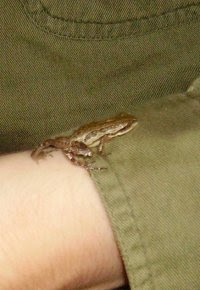 While Jeremy was out mowing the lawn he came across this tiny little Western Chorus Frog. 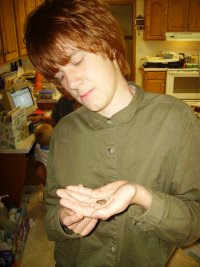 The frog was young, though no sign of being part tadpole. We didn't get it to chirp. This frog was only about 3/4 an inch long. I got a close-up of it climbing Jeremy's arm. Wed morning I took the car to Fosston to get the CV boot on the right side repaired. I did the left last year. Now, except for the noisy muffler, the car should be good to go. In the afternoon I worked on sermon prep. and some audio for the shut-ins. Thursday I took Louisa with me on shut-in calls. We were able to get to three shut-ins. I found out that Cora R. has gone back home to live with her brother. So I'll stop in there next week. I'll have to remember to get Hymnaries to the shut-ins so they can use them during the audio devotions I'm putting together. Friday, well, Alyssa came this morning and did the bulletin. I did some filing and this afternoon I'm going out for another shut-in visit. 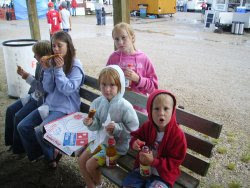 The kids hope to do two things 1) go to the Pennington Co. fair, and 2) see the new Harry Potter movie. We have to wait until UPS comes. We ran out of check blanks last week. Today Quinten came over to work on the faucet for our kitchen sink. We are so blessed to have congregations and members who take care of us so well. In the afternoon I took my cousin, Amber, and my daughters, Louisa and Elsie, along on shut-in visits. We had lunch at Johnnie's. Bruce and Denise are so good to us. After lunch we went to Louella's. Louella is doing well. We spent some time there. The girls and Louella got along very well. After that we went to Marlowe's. But she wasn't home. We knocked until all the neighbors came to peek out their doors, in case we were knocking at their doors. I'll try again with Marlow later on. After this we stopped at the library to drop off a few items we had borrowed and went to Wal-Mart. I got the oil changed on my car there and picked up some grocery items. We got home just before 6pm. I grilled fake mignon for supper (that's hamburgers wrapped in bacon) with grilled asparagus and hash browns. And Matthew surprised us with dessert. 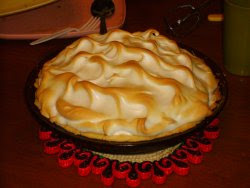 Matthew put together a gluten free lemon meringue pie for us. This was his first pie ever. I hope he can work well to improve his cooking skills (as I hope for all my kids). But thank you, Matthew, for a nice desert. 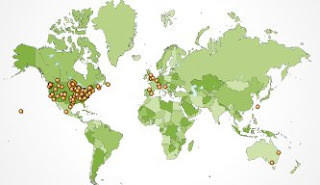 We've had a large number of visitors to this blog this week. Part of that is due to all the readers of Primitive Archer magazine. 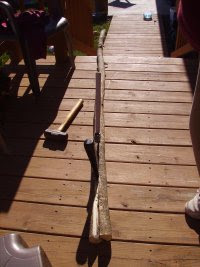 As regular readers know, I've been working on a bow made from an Ash sapling since last November. I posted my work to Primitive Archer's forum. And a great number of people checked out my bow. I thank them for the time they took and for their encouraging words. Pappy, some day I hope to produce something that the readership of the magazine would enjoy. Thanks for all the positive comments from the readership. Monday is usually my day off. I didn't take a day off today. But here is some of what happened during the day. The kids thought Grandpa and Grandma's cage for their dog "Foxy" was a nice little place to imprison Stella. She couldn't figure out how to escape. But they all wanted to take turns in the cage. John was so excited he wet his pants in the cage. Well, we're still working on him with potty training. He comes into the house some times all excited and dancing around. We say, "Go into the bathroom, put the stool in front of the toilet, sit down, and aim." I think Mary washed the dog cage. Mary found this critter today. 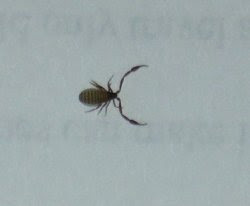 It's a pseudoscorpion. They're tiny. This one I photographed on the back of a print out. You can see the 12 point font in the background. These are good critters to have around as they eat "clothes moth larvae, carpet beetle larvae, booklice, ants, mites, and small flies." I think it would be cool to see a battle between this little bug and these other bugs. But they're so small I doubt I'd ever see such a thing. In the afternoon I took my grandparents on a visit to Henry and Betty's. Lonny popped in for a bit. It was so nice to hear Henry and my Grandpa exchanging stories about WWII. My Grandpa was a Marine deployed to the invading fleets on Tarawa and Saipan. Henry worked in Wisconsin making the munitions that Grandpa used while he was there. They spent a bit of time talking about the manufacture of the brass rings used on munitions to enable the rifling to work. 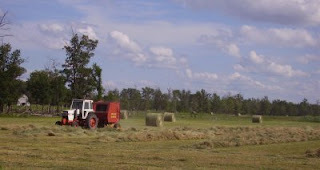 Lonny was out baling hay. Betty and Henry seem a bit more fragile than they have before. Please keep them in your prayers. I recorded some of the conversation that Henry and Grandpa had. 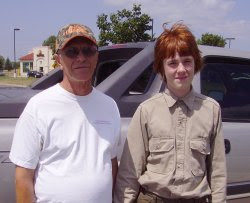 I'm trying to make an oral history of Grandpa's time in the service during WWII. I made a CD for Grandpa last year of what he had told us. I'll see what I can produce this year. If there is interest in this, I can find a way to post the audio. I'm glad that my Grandparents met Henry and Betty. I've thought for a long time that they would really like each other and become friends. And I'm really glad that they could meet and establish this friendship. It's so nice to be able to sit back and listen to these men and women exchange stories and opinions about such great events in history.